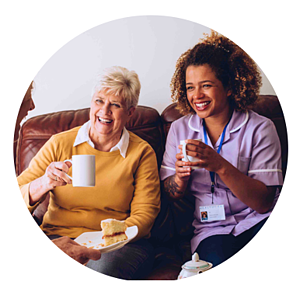 Tender Rose partners with Geriatric Care Managers to deliver expert, one-on-one dementia care to clients in their homes. We follow and execute on established care plans, and provide expert caregivers who can manage the behavioral challenges of dementia. Our Memory Care Professionals (MCPs) are all highly trained in person-centered, activity-based care that improves the quality of life for people with dementia, their families, and their Geriatric Care Managers. We carefully select MCPs with dementia training and experience and provide ongoing education to help improve their dementia care skills. Our MCPs are skilled in helping clients complete their ADLs, but also focus on improving quality of life and promoting independence. Instead of a revolving door of caregivers, our reliable team is carefully matched with clients with a focus on developing long-term relationships. We publish caregiver schedules one month at a time, ensuring consistency, reliability, and predictability. This approach also eliminates scheduling surprises for you and your clients. We invite Geriatric Care Managers to biweekly conference calls with our caregivers to keep them in the loop on what’s working—and what isn’t. Our proactive approach to communication also includes iPads in every client home and online shift reports so that the entire team is on the same page. Our mission is to partner with Geriatric Care Managers to reduce challenging behaviors and make every day a good day for your clients, their families, and you. Your clients deserve the best care. Contact us today.